Just like humans, our pets also have specialized doctors who can perform orthopedic surgeries dealing with the skeleton, joints, and soft tissue like cartilage, joint capsules, ligaments, muscles, and tendons. At Lone Oak, our doctors have the training and experience to perform the most common surgical procedures to the most advanced. Our doctors know that when a major bone is broken, surgery may be the fastest and most comfortable road to recovery. 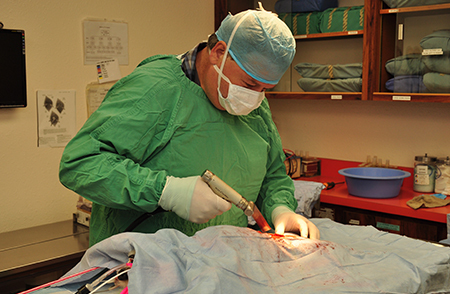 Surgery may also be the best approach to ensure that your pet’s bones heal straight and solidly and that their leg functions well after surgery. Lone Oak Veterinary Clinic is also proud to be the only veterinary clinic in our area to perform the Tibial Tuberosity Advancement (TTA) procedure. This surgical procedure repositions the torn ligament with a titanium or steel plate that provides stabilization and improved mobility. Click here to learn more about the TTA procedure. If you have any questions regarding our veterinary orthopedic procedures, please feel free to call our office at (559) 732-4818.